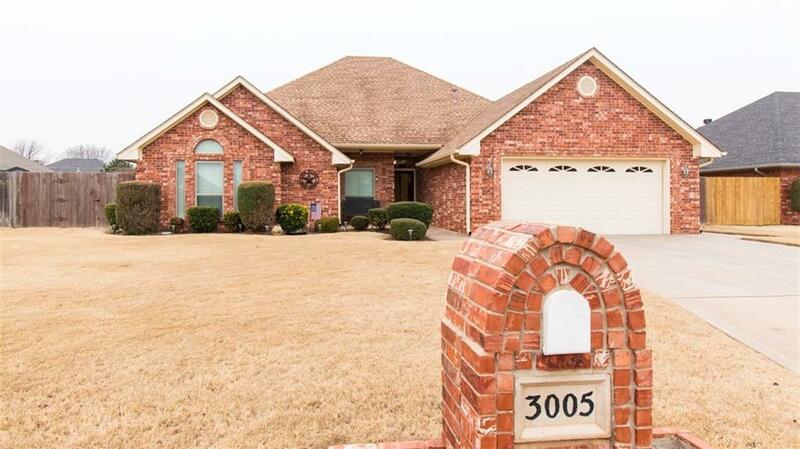 3005 Garrison Road Altus, OK. | MLS# 852764 | CENTURY 21 Altus Prestige Realty, Inc.
LOOK AT THIS PROPERTY ON GARRISON ROAD!! 3005 Garrison Road is offering a one owner home that comes with a 4 bedroom/split plan, 2.5 bath, 2 car garage and a BRAND SPANKING NEW KITCHEN!! This beautiful kitchen has been completely updated with cabinets, granite counters, kitchen island/breakfast bar with tons of storage, all appliances stay, under cabinet lighting and a super large dining area. This is a split plan so the master bedroom and bath are good size and is located next to the laundry room….as it should be! The master bath comes with an oversized jetted tub, separate shower, double sinks, private commode area, and THREE closets!!! There is canned lighting throughout most of the home as well as custom shutters. Upgraded tilt-in windows for easy cleaning. Gas fireplace in the living area. Sprinkler system, wood privacy fence on concrete runners, large covered back patio and a storage shed. Also comes with a water softener!